Back2Stonewall Sunday Tea Dance 1978: "Mac Arthur Park Suite" by Donna Summer - 17mins, 51 sec. Home/Entertainment/Back2Stonewall Sunday Tea Dance 1978: “Mac Arthur Park Suite” by Donna Summer – 17mins, 51 sec. Back2Stonewall Sunday Tea Dance 1978: “Mac Arthur Park Suite” by Donna Summer – 17mins, 51 sec. 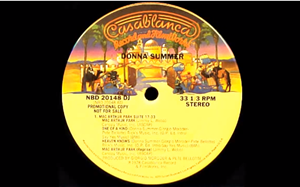 The multi-million selling vinyl single disco version of “Mac Arthur Park” by Donna Summer was number one on the American pop music sales charts for three weeks during 1978, and was nominated for the Grammy Award for Best Female Pop Vocal Performance. Summer’s recording, which was included as part of the “Mac Arthur Park Suite” on her double album Live and More, was eight minutes and forty seconds long on the album. The shorter seven-inch vinyl single version of the Mac Arthur Park was Summer’s first single to reach number one on the Billboard Hot 100. The nearly 18-minute musical medley “Mac Arthur Park Suite” incorporated the songs “One of a Kind” and “Heaven Knows”. This medley was also sold as a 12-inch (30 cm) vinyl recording, and it stayed at number one on Billboard‘s Hot Dance Club Songs chart for five weeks in 1978. Pass those poppers and let’s dance! “MacArthur Park” was written by Jimmy Webb in 1968, originally composed as part of an intended cantata. The song was initially written for and rejected by The Association. Richard Harris was the second to be offered the song and the first to record it for his “pop music debut”; the song was subsequently covered by numerous artists. with the best-known behind Donna Summer. The real inspiration for “MacArthur Park” was the relationship and breakup between Webb and Susan Ronstadt, a cousin of singer Linda Ronstadt. MacArthur Park was where the two occasionally met for lunch and spent their most enjoyable times together. At that time (mid-1965), Ronstadt worked for a life insurance company whose offices were located just across the street from the park. Webb and Ronstadt remained friends, even after her marriage to another man. The breakup was also the primary influence for “By the Time I Get to Phoenix,” another Webb composition. Donna’s cover of Mac Arthur Park was Jimmy Webb’s only song to reach number one in the US.